So, here it is. One year later. 1. 316 miles ridden to date and this month I have topped out the most miles I have ridden in a single month, which is 61 miles. Of course, if you subtract the 15 miles from the Cockaponset ride it still works out to be a net increase in riding by 118%! 2. Dropped 15 pounds and consitently keeping my weight around the 200 to 205 mark. Pants fit much better and I gained another hole on the belt! 3. Two and a half bikes. The Trek 3700 was fun and still has a purpose in life - trailer biking and riding with the kids. Once Katie can ride on her own I am getting a rear seat for Elliot. Not sure if I am going to get the kid trailer. I can just imagine Elliot squeezing Brodie's hand too hard, Brodie crying, and me not going any where. The half bike is Katie's trailer bike. And then there is the brute, weighing in at around 37 pounds, the Giant AC. This bike has performed beyond my expectations. 4. Established a presence in the Connecticut Mountain Biking community, with some spillage into Westchester County. Joined NEMBA and am now on the Board of Directors. So where do we go from here? More miles, more riding, more Cross Stuntry, within reason of course - don't need anymore Boomer-itis statistics for the medical community, and definitely want to start racing. I think I want to get the 29'er for that. That will be my venture into realm of clipless peddles and who knows, maybe I will convert the AC to clipless as time goes on. Recap of today's ride in the Upper Paugussett State forest (map above). 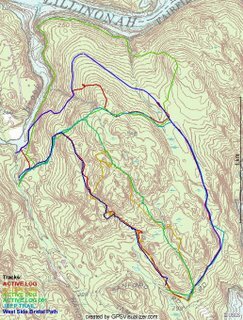 I decided to follow a notion that the current layout for the Polly Brody Forest Road wouldn't make any sense a hundred or so years ago so I decided to follow the connector on the White trail and found that there is a road, approximately the same width that continues on into the forest heading towards the lake. I followed the trail about 100 yards in to where there were a lot of trees down and it seems to continue on. 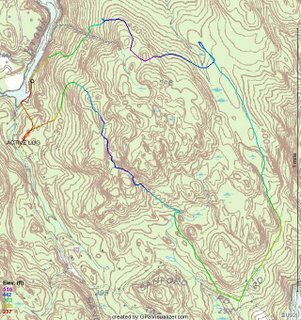 Below is my approximation (blue) of where this road would have continued if my theory is correct because where I pick it up on the dropzone leg (red track line), it appears to head into the forest, in the approximate same direction. My guess is that it follows the contours and climbs as little as possible, curves around the hill to meet up with the section near the white trail. Also re-rode what I called the Equestrian Trail that I rode last fall with Lame NYer and found all sorts of Newtown Open space markers, so the "Yellow" trail which is NBLA's first attempt at a trail through this part of the forest definitely crossed into the Town's openspace property and that is obviously a no-go. 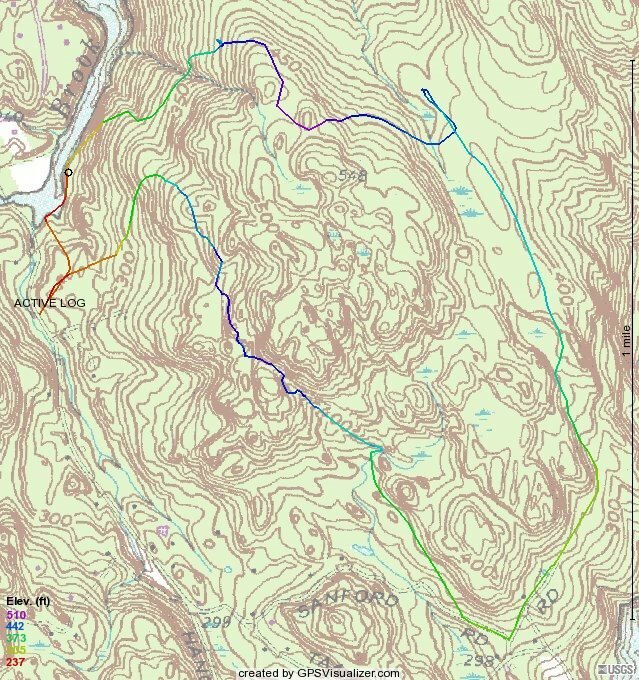 Even with the proposed changes that we walked (Cindy and Paula) a couple of weeks ago, the climbing is such that the trail would not lend itself to be a good mountain biking trail. So, it looks like the Multi-use trail that we were planning for the forest might have to take alternative route, especially if we can't get CFPA let us traverse their hallowed ground. Congratulations on the 1 year anniversary.